NEW YORK – The Robert K. Kraft Center for Jewish Student Life, Columbia/Barnard Hillel, announced today a $2.5 million endowment gift from Jonathan (Columbia College ’88) and Jeannie Lavine and family. 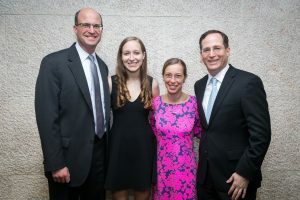 In appreciation of the family’s generous support of Jewish life at Columbia University, Columbia/Barnard Hillel’s Executive Director position will now be named the Lavine Family Executive Director. The gift was announced this evening by Robert K. Kraft, Columbia College ’63, at Columbia/Barnard Hillel’s Annual Seixas Award Dinner. Jonathan Lavine is the Co-Managing Partner of Bain Capital and the incoming Co-Chair of the Trustees of Columbia University. He was recently presented with the 70th Alexander Hamilton Medal, the highest honor awarded to a member of the Columbia College community for distinguished service to the College and accomplishment in any field of endeavor. Jonathan and Jeannie are the parents of Allie, Columbia College ’16, and Emily, Columbia College ’18. The Lavines have been involved in many aspects of Columbia/Barnard Hillel’s work. Jonathan was awarded Columbia/Barnard Hillel’s Seixas Award in 2015, in recognition of his support of Jewish life on Columbia’s campus. The family has generously supported the work of Columbia/Barnard Hillel for years. Columbia/Barnard Hillel reaches more than 1,000 students annually. It is the catalyst for students to explore and consciously define their Jewish identity. Hillel helps students, regardless of their origin or destination, find their own interpretation of Jewish values, culture, community and religion by empowering them to explore, learn, and grow intellectually, spiritually and socially. Columbia/Barnard Hillel is based out of the Robert K Kraft Center for Jewish Student Life.